A collaborative research project between the University of Bath and Wessex Water investigating using algae as a natural and sustainable way to treat wastewater. The team working at a water treatment plant to devise a way of purifying water using Algae. 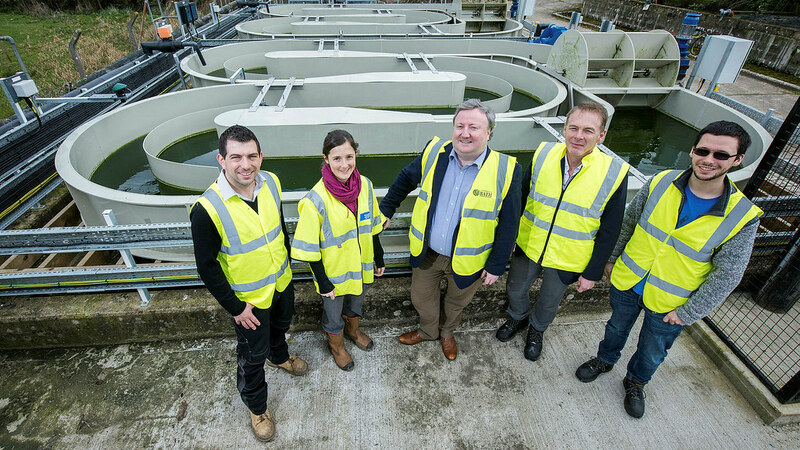 The University of Bath’s Water Innovation and Research Centre (WIRC @ Bath) and water utility company Wessex Water, have teamed up to create algae ponds to remove nutrients from wastewater, whilst also generating a valuable by-product. The team, led by Dr Tom Arnot in the University’s Department of Chemical Engineering and Professor Rod Scott in the Department of Biology & Biochemistry, is investigating utilising algae ponds to treat wastewater and reduce levels of phosphorus. Phosphorus is a non-renewable resource present in human waste and used in detergents, agricultural fertilisers and cleaning products. It is also a water pollutant which can cause both environmental and economic damage. Removing phosphorus from water bodies has become an increasingly key concern for the UK’s water utility companies, with pressure from the Environment Agency to find new solutions due to the Water Framework Directive (WFD). When phosphorus levels become too high in the environment, eutrophication can occur. High phosphorus causes an increase in algal blooms and other aquatic plants, which leads to a depletion in oxygen levels within the rivers and streams, as well as the potential release of toxins from the algae. This phenomenon results in a significant loss in plant, insect and fish species and an overall less healthy watercourse. Many lakes, streams and rivers are currently failing to meet the strict standards set for nutrient levels under the WFD and whilst sewage treatment works are overall achieving high rates of nutrient removal, more needs to be done if these challenging targets are to be met. The current trial aims to use a ‘managed eutrophication’ approach to address this problem. Rather than allowing wastewater to release nutrients which encourages algae to grow in the watercourse and cause damage, algae are grown at the sewage treatment works in a managed way and removed before the water enters the river. This results in “polished” wastewater that can then be released into the river, and algae biomass which can be recovered and used as a resource. To achieve this, a pilot High-Rate Algal Pond (HRAP) system has been installed at Wessex Water’s sewage treatment works (STW) in Beckington, Somerset. HRAPs have been successful in growing algae for food components in other countries but this is the first time such a potentially sustainable solution is adapted for phosphorus removal and deployed at a pilot scale in the UK. The trial is treating approximately 3,000 litres of wastewater per day, while removing 80-96 per cent of the phosphorus present. It also aims to assess the performance, costs, reliability and practicality of this sustainable technology in order to determine whether it can be a suitable solution for phosphorus removal in realistic conditions. Unlike other countries which benefit from more regular and consistent weather conditions, the researchers will trial this approach across the different UK seasons which experience varying light and environmental conditions. The system at Beckington consists of two shallow ponds with a total functional area of 60m2 and capacity of 18,000 litres, where wastewater is continuously circulated by paddlewheels. The HRAPs are seeded with the desired species of algae and fed with final wastewater effluent, which would otherwise be released into the environment. Within each pond, algae use nutrients in the wastewater, sunlight and carbon dioxide to grow, thereby reducing overall nutrient levels including phosphorous. A proportion of the water and algae mixture is then moved to a settling tank and separated daily, while fresh effluent is added to top up the ponds. This results in “polished” wastewater with lower levels of harmful nutrients which can be returned to the environment, and algae rich in nutrients that can be used for various purposes such as bioplastics, biofuel and agricultural fertiliser. Thus, by using this system algae can be grown in a managed way and removed before wastewater reaches the river. Currently, traditional methods for treating sewage water use chemical dosing with iron salts to bind phosphorus. However, new technologies are needed to meet tightening environmental regulations for a variety of STW types and sizes while avoiding a significant increase in consumer’s water bills. Every day over 11 billion litres of water is used in the UK domestically and in industry. This wastewater must be cleaned or treated before it can be safely released back into the environment, or risk causing serious harm to both human health and the natural environment. Wessex Water treats 480 million litres of sewage from 2.8 million customers every day. The company has 409 sewage treatment works and 1,660 sewage pumping stations. This phosphorus removal approach is suited to smaller sewage treatment works such as the site in Beckington which serves a population of around 1,000. Dr Dimitrios Kaloudis, Research Associate in the University of Bath’s Department of Biology & Biochemistry and operator of the trial at Beckington, said: “In theory, HRAPs could offer an environmentally friendly and sustainable way of removing phosphorus from wastewaters and consequently improving the health of our rivers and lakes without a massive increase in consumer’s water bills. The project has been funded by the UK Water Industry Research (UKWIR) and by the end, the research team intend to have demonstrated HRAPs as an environmentally sustainable and economically attractive approach for removing phosphorus down to low concentrations which will benefit both water utility companies and consumers in the UK. This project is one of a number of trials being undertaken by all water and sewage companies across England and Wales as part of a national collaborative programme to investigate new phosphorus removal technologies. At the end of the trials, the numerous water and sewage companies will share the results of their trials with each other and the Environment Agency in an attempt to identify the best solutions to removing phosphorus. This collaborative programme will benefit not only the customers of water utility companies but also the water environment in England and Wales.